So how does that fit in with our books? Book length – It seems that in the past readers were reluctant to buy a really thick book since it was heavy to hold and difficult to carry around. With the advent of ereaders though this size and weight restriction has been removed and readers are happy to buy a longer book. Presumably people see it as value for money. I know I feel cheated if I buy a book which turns out to be 30,000 words or less – no matter how good it is. Amazon often give a page count but in practice it’s often unreliable. Today, before I buy an ebook I download the sample or look at the preview. It represents 10% of the book so if it’s short – expect a short book. As you can see all of our books are longer than the former 80,000 word ‘standard’ length. We chose shorter book titles the shortest being ‘No Secrets’ and the longest being ‘Stones, Stars and Solutions’. Our titles average 2.8 words, 16.3 characters. Book Price – Some time ago I came across a complicated formula which attempted to back engineer the Amazon book rank formula. One of the factors it included was the price Amazon perceived as the book’s ‘normal’ price. In most cases that was the price the book was initially sold for. Now it just so happened that I had two books which had sold about the same numbers and were released at about the same time but were different prices $2.99 and $3.99. The $3.99 book had a much higher rank! It makes sense I suppose for Amazon to rank books at higher price better than those at lower price – it will after all, make them more profit. It seems to me that $2.99 is not the best price even though lower prices tend to lead to increased sales. Mark Coker’s survey tends to confirm that the best price for an author’s book is $3.00 to $3.99 rather than the most common $2.99. It seems that most authors are charging about one cent per 300 words. And our books? Ours average $3.95 with the most expensive being Stones, Stars and Solutions at $5.01 and the least expensive being No Secrets, our shortest book. Dark Secrets, book 2 in our series, is probably under-priced at 0.75 cents per 300 words. Giving away a free book – Back in April 2012 we joined Kindle Select and gave away free copies of our series book 1, A Vested Interest. The response was incredible with over 2,000 copies being downloaded in the three days it was free. Ten days later sales of our other books took off and by the end of the month we had sold eight times as many books as we sold in the previous two years! Why the ten day lag? That’s the time an average reader took to read it. It was clear to us that giving away book one of our series worked as a method of boosting sales. For every 16 books we gave away we could pretty well bank on someone buying more of the series. The trouble was that after that three day period sales steadily decreased and we used the remaining two days we had for freebies to boost things again. It helped only slightly because half way through April Amazon changed it’s system of book ranking so that free downloads no longer counted with paid sales when working out book ranks. 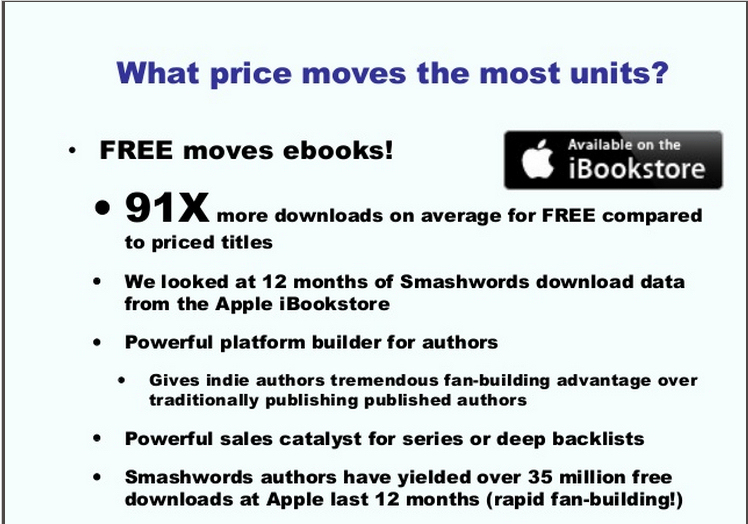 The solution was to withdraw our books from Kindle Select and publish them at Smashwords where we could make book one free all the time. It took a while for Amazon to price match but now book one – A Vested Interest is free all the time at Amazon.com and free most of the time at Amazon.co.uk. In total we’ve now given away (as of 1st June 2013) 18,128 free copies of A Vested Interest and are convinced the policy works for a book series. You can read the full Smashwords 2013 survey at http://blog.smashwords.com/2013/05/new-smashwords-survey-helps-authors.html If you’re an author – you should read it.